Two panel Gospel tracts come in a variety of styles and designs. The common feature is that the plan of salvation is concisely presented in two inside panels. The front cover on many two-panel tracts is customizable and the back panel is dedicated to your church information. There are two paper options for two–panel tracts. The "Matte Text, Normal Paper"is a 100# matte text. This is a very nice paper. The "Matte Cover, Paper UPGRADE" is a #100 matte cover stock. It's a thick and durable stock. There is a noticeable difference in the paper thickness. I personally use this at our church. I love this paper. 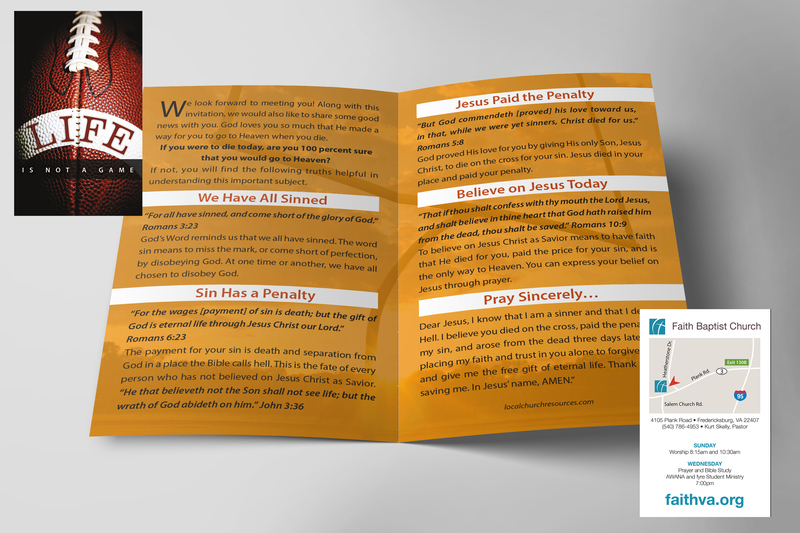 When you order your two-panel Gospel tract, the design, printing and shipping is included. The prices listed are the final prices. We will send you a proof by e-mail in 3-7 business days (sometimes less) after you place your order. We will never print your tract without your final approval.